I talked about the voice in a previous article now I’m going to look at the next step in the chain – the microphone. There are many mics on the market that fall into different categories with varying specifications enabling them to handle different jobs. In this article I’ll look briefly at how a mic works, the microphone types available, what to look for and mic technique. When someone speaks or sings they produce rhythmic bursts of air pressure from their larynx. These waves of air pressure (sound waves) travel through the air and cause vibrations in the listener’s ear. The ear contains a mechanism that amplifies the waves then turns them into electrical information that is then fed to the brain for processing. The shorter the time between each pressure wave hitting the ear or in other words the higher the frequency of the waves the higher the pitch of the sound that is heard. For instance 440 waves per second will produce the note of ‘A’. If you double the frequency the pitch goes up by an octave. A microphone works much in the same way as the ear. Sound waves hit a diaphragm in the microphone causing it to vibrate. These vibrations are converted, by the microphone, into a small electrical signal. This signal is fed from the mic to a preamp which boosts it before feeding it to sound processors. Once the signal is processed with things such as equalisers, reverb, echo, etc. it is passed to another amplifier that boosts the voltage enough to cause the loudspeaker cones to vibrate and produce sound waves in the air. As you can see a mic works in the opposite way to a loudspeaker by converting waves of air pressure (sound waves) into electricity while the speaker converts electricity into sound waves. The mechanisms are similar and it is possible to use a speaker as microphone although not a very good one. Some microphones give an uncoloured or flat response meaning they reproduce the sound without boosting any of the frequencies. This type of mic is used mostly in studios. Other microphones are tailored to certain jobs and may boost or attenuate certain frequencies to give tonal qualities such as warmth or better clarity for vocals. On the spec sheet for a mic you will see a graph which plots decibels (volume) against frequency. A flat response will be denoted by a flat line. If the microphone has a frequency response tailored to vocals then you would expect to see the line form a peak around 4kHz to 6kHz which is where presence and clarity for the human voice is added. You will also see the far left and the far right of the line (low and high frequencies) dip lower. This shows where the frequencies are being rolled off at the top and bottom ends of the spectrum. 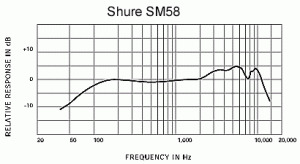 This is a graph for the Shure SM58 microphone which is a very common mic for live vocals. Sound pick-up patterns or polar patterns are the areas around the microphone that the mic can pick up sound from. Some microphones will pick up sound from all around (omnidirectional) some from two directions (bi-directional or figure of 8) while others are built to reject sound from the rear and pic up sound from the front and sides (cardioid). A cardioid pattern is most commonly used by singers on stage and, as the name suggests, produces a heart shaped area of sensitivity around the microphone. Sound to the rear of the mic is largely ignored therefore this type of mic helps to reduce feedback problems that result in that terrible screeching banshee noise. Hypercardioid polar patterns are similar to cardioid but the heart shaped area of sensitivity is narrower which mean less sound is picked up from the sides of the mic. This is good when you want to focus more on a single sound source without picking ambient sounds that are either side of the source. It gives you more isolation of the target sound source. This really is a loudspeaker in miniature and reverse. The diaphragm vibrates in time with the sound waves that hit it causing a small coil of wire to move within a permanent magnetic field. This, as we all know from school, produces an electrical current in the coil. That’s it a simple passive device that needs no power to make it work. Moving Coil Dynamic microphones are very sturdy and can withstand high sound pressure levels without distortion. Their ruggedness makes them ideal for life on the road and they are the workhorse of the gigging musician. Two legendary dynamic mics that have been around for decades are the Shure SM58 and the SM57. The SM58 is a classic vocal mic with tailored response making vocals clearer and warmer. The SM57 is an instrument microphone recommended for snare, toms, electric guitar, percussion and brass. Subjectively, dynamic mics are said to produce a warmer sound. In ribbon microphones a metal ribbon is caused to move by the sound waves entering the mic. This movement is between two magnetic poles so that an electrical signal is induced in the ribbon as it cuts the magnetic flux. Historically ribbon mics have been less sturdy than dynamic moving coil mics but newer models are getting more durable and better at withstanding jolts. With older ribbon mics the output voltage was very low but this, as well, is being addressed in newer mics. Ribbons were in their day the high end studio microphone of choice but have been replaced by condenser mics. The beauty of a ribbon is that it produces a natural warm sound with clean upper frequency detail and a rich low end. The polar pattern generally tends to be bi-directional (figure of eight) meaning sound is picked up equally from the front and the back of the mic but not the sides. This can be a disadvantage for live work. Switchable polar patterns are available. Condenser is the old name for an electronic component now called a capacitor. The name condenser has however stuck with the type of microphone that uses a capacitor as a transducer. The capacitor is made up of two small conducting plates in close proximity and insulated from one another by a small gap. The front plate is the diaphragm that vibrates when hit by sound waves. The movement of the diaphragm changes the gap size between the two plates and so alters the capacitance of the capacitor. This varying capacitance causes proportional states of charge and discharge in the capacitor and so produces the electrical signal. Unlike the previous two mics, a condenser microphone needs a power supply to make it work. This can either be a battery inside the mic or power can be drawn from the mixer that the mic plugs into. This second option is called Phantom Powering. There is another type of condenser mic called an electret condenser that has a permanent static electrical charge built into it. These do not need a battery or phantom power to polarize the capacitor but they often have a built in pre-amp, which does need power, so it’s back to a battery or phantom power again. Condenser microphones tend to be brighter than dynamic mics picking up more of the higher frequencies. Because the diaphragm does not have a coil attached, like dynamic mics do, they respond more quickly and are better with transients. Because they generally have a flatter frequency response, condensers make good studio mics but they are more prone to distortion at high volume levels. Condenser microphones can have large or small diaphragms. Large diaphragms are around 25mm in size and are the mics preferred for recording vocals. The small diaphragm condenser mic tends to be used for acoustic instruments and for picking up the ambience of a drum kit. Microphones can be low impedance (low Z) or high impedance (high Z). I’m going to skip through this and say professional mics are low impedance and that’s what you should go for. Hi Z mics tend to be for the domestic market and are comparatively cheap. For vocals: In the studio a sensitive, large diaphragm condenser microphone with a switchable polar pattern will work very well and produce crystal clean sounds. On the road and for live performance a good quality cardioid dynamic mic, with a tailored response, will better stand up to the rigours. The cardioid polar pattern will help control feedback and the mic will produce punchy, warm sounds. Also for live performance, don’t rule out some of the modern condenser mics made for touring and live stage work. How a mic is placed in relation to the sound source makes a lot of difference to the quality of the final sound. Unfortunately there is no definitive guide that states exactly where a mic should be placed. There are some starting points but after that it’s mostly a question of experimentation to find the best position and best sound. For a vocalist, in the studio, you can start with the mic pointing directly at the mouth and on a level with the mouth at a distance of about 15cm to 20cm. For live stage work the starting distance should be 2.5cm to 5cm. You can then start experimenting to find the best sound. One obvious thing to do, with placement, is to make sure the feet on your mic-stand and the mic cable are not going to be in the way and cause you to trip. I’ve seen it happen. The bass frequencies get stronger as you get closer to a microphone; this is called the proximity effect. If the vocal has a bit too much bass then move back a little. If you want to create a warmer more intimate sound try moving closer in to the mic. If the sound is too bright or tongue, lip smacking and wet mouth noise is being picking up you can try tilting the mic slightly away from your mouth so you are singing a tad off axis. (On axis being when you are singing directly into the centre of the mic.) This will help reduce some of the high frequencies. If the voice sounds too nasal you can try moving the mic to above nose level. With the mixer you can also try attenuating the signal at around 1,000Hz. Play around with this for the best effect. Letters like a ‘P’ or a ‘B’ can create a sudden burst of air pressure which on hitting the mic creates a pop or a thump sound. This high pressure discharge is called a plosive and it can overload the mic and preamp. In the studio you can break up the blast of air from the plosive by putting a pop shield between the singer and the mic. I’ve used material from a pair of tights stretched over a loop made from a wire coat hanger. This worked just fine but professionally made pop filters can be bought for £15 or less. The shield should be placed about 30mm away from the mic. Foam wind shields, placed over the mic, can also be used but are not very effective. They also have a bad effect on the high frequencies. Plosives are caused by the lips with P’s and B’s and by the tongue with T’s and D’s so, as a singer, be aware of this. Try to soften words beginning with these letters and try not to blast them directly into the microphone. A ‘Pop’ tends to be a low frequency sound so with EQ try cutting the signal below 80Hz. It won’t stop the Pop but it will help. At the other end of the frequency scale is sibilance. This is the hissy sound produced from the letters S, C & Z. It’s more of a problem in studios than in live work and luckily, in studios, there are a number of de-essing tools that can be used to help deal with the problem. A dynamic mic is best for this because of the high pressure levels involved. Then, as before, you will need to experiment to get the best sound and placement. For a good bright sound, start off with the mic positioned close-up, on axis and pointing directly at the centre of the speaker. Then start experimenting to get the sound you want. If your cab has two speakers you might find one of the speakers sounds better than the other or it may rattle or buzz less. Try moving the mic off axis and also pointing it at different parts of the loudspeaker cone to see what effect that has. There is so much that can be written about mic’ing up a drum kit but I’m not going into that subject too deeply as I’m dealing mainly with vocals this time around. I’ll just say that close up mics on individual drums are going to get a lot of sound pressure so dynamic mics are good especially for the bass drum. An overhead condenser mic can be used to capture the high frequencies of the cymbals. When recording, a condenser mic can be used further away to pick up the ambience of the kit as a whole. When using multiple mics for one sound source you have to start thinking about phase cancellation. This is where the sound can be attenuated as a result of two mics each picking up a wave but at a different point in its cycle. If you want to know about phase cancelation there is an SOS article here. All electrical equipment makes noise, some more than others. In audio equipment that noise is reproduced through the speakers as hiss or hum. When wanted sounds are reproduced, such as music or vocals the noise is masked. The volume level of the unwanted noise and the volume of the wanted sound are the two levels used to give the Signal to Noise Ratio (S/N or SNR). It is measured in decibels and the higher the number the better. The sensitivity specification of a microphone measures the amount of electrical signal it produces for a set level of sound pressure. In other words how well it converts sound into electricity. A mic with high sensitivity is louder than a mic with low sensitivity by virtue of the fact that it produces a stronger electrical signal from the same level of sound input.